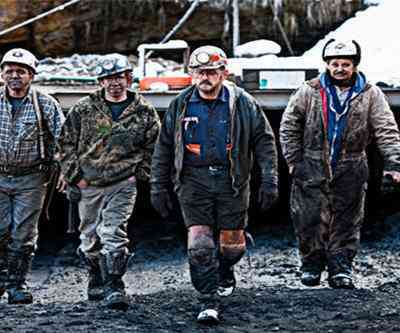 The operator of the Appalachia mine featured in the reality show "Coal" is being sued in US federal court for failing to pay two companies the production royalties they maintain they're owed reports The Charleston Gazette. The two entities that are suing – Encoal Energy and Gopher Land Services – says Canadian-owned Cobalt Coal Co. stopped the payments in May, but "was still actively mining as of this week and is now effectively trespassing because Gopher owns the land where the mine portal is located". The tight confines of the small mine don't represent the reality of an industry largely dominated by corporations with massive mines that often have hundreds of workers and mining machines larger than houses. Cobalt is small, with only about two dozen employees. Its crews mine a highly valuable metallurgical coal used in steelmaking, but the seam is notoriously thin, forcing them to work in a space just 42 inches high some 600 feet underground. To shoot in the mine, 10 videographers trained for 80 hours and were certified as apprentice coal miners.